NYCFC will spend Easter Sunday in the nation’s capital, facing DC United for the second time this season. The two teams drew 0-0 at Yankee Stadium in March, and a similar low-scoring contest may be in store, as DC has gone scoreless in two consecutive home matches. Domè is still on the hot seat after City’s fifth draw in six matches, and another week without a win may be the final straw. Throughout Domè’s tenure as manager, City have usually set up in a 4-2-3-1 formation. However, Torrent has often changed the team’s shape away from Yankee Stadium, as he did in Minnesota last weekend. With Mitriță, Héber, and Maxi all seemingly healthy at the same time, we may finally see Domè’s preferred shape for 2019. The 4-2-3-1 formation allows Domè to play his best eleven. The return of Alexander Callens allows the usual back line to start, with Ronald Matarrita taking back the starting left fullback position from Ben Sweat. James Sands and Alex Ring should slot back into their usual midfield positions, allowing Ring the freedom to get forward. A healthy first-choice front four should get City supporters excited, with Maxi Moralez, Alexandru Mitriță, Ismael Tajouri-Shradi, and Héber all available for selection. City’s Home Opener was a tale of two goalkeepers, with Sean Johnson and Bill Hamid both saving everything they saw. Johnson showcased his reflexes early, saving a Luciano Acosta shot from about nine yards away. By the end of the first half, NYCFC had only registered one shot on target, a first time shot from Alex Ring from far outside the box. Johnson and Hamid continued to hold their clean sheets throughout the second half, with the only clear-cut chances falling to NYCFC in the final five minutes. Hamid saved a diving header from Alex Ring, and Jonathan Lewis missed a golden chance in added time. A boring contest finished with a boring scoreline of 0-0. In a perfect exemplification of City’s early season troubles, the boys in blue were simply not clinical enough in the final third, continuing their home woes under Domè. Follow Nick Fiorino on Twitter at @stretch_fio and The Third Rail at @ThirdRailSC. Visit our website at thirdrail.nyc for merchandise, weekly game previews and more. Interested in joining? Click here. On Saturday, NYCFC travel to Minnesota looking to break their early season slump. Fans knew this season would be different without David Villa, but the front office seemingly did not. City were without a true centre forward for weeks, with Mitriță and Taty sharing time in the middle. While the boys in blue continue their objectively frustrating start to the year, City supporters continue to clamor for changes at the top. Domè has been a disappointing hire for many. We all know the numbers: 4 wins in their last 21 matches, no goals in their last 200+ minutes, and an overall abysmal effort to penetrate into the final third. Last season under Patrick Vieira, City were undefeated at home, winning six of seven, outscoring opponents 19 to 3. Under Torrent, the fortress that was Yankee Stadium has turned into a sand castle. Fans will remember the first month of Domè’s tenure. A mystical week of three home victories, three clean sheets, a victory over our cross-state rivals, and quite possibly Jonathan Lewis’ best week of his young career. Fans will also remember Domè’s estimation that he would need at least a month, and a transfer window to implement his preferred style. He turned to the club’s youth, something Vieira never did, and was rewarded early. This first group of matches as manager would prove to be the last remnants of the Patrick Vieira era in the Bronx. Torrent soon added Eloi Amagat and Valentin Castellanos to the team, and promised supporters something new on the pitch. City then went four in a row without a win at home. They finished the season losing five of six away from Yankee Stadium, eventually hobbling into the playoffs where they were soon eliminated, marking another year of what could have been. So, if NYCFC lose this weekend and management does decide to sack Domè, what really would change? We would certainly see more of Keaton Parks in the sky blue; It would be hard to fathom a situation where he could play any less. We would see less of ‘Taty’, a Domè favorite, but that is likely to happen anyway with the arrival of Héber. A new manager would change our style of play? Certainly not drastically: the starting lineup would likely remain the same, and this team is built to play a certain way, whether we like it or not. All of this without asking, who replaces Torrent? Other notable clubs have started the season poorly too. The Red Bulls and Atlanta United have both faced challenges to start the season in the East, and the Timbers have earned one point from five matches, holding a -10 goal differential in the West. We are 5 games into a 34 game season. While Domè has been incredibly disappointing, City have a very strong roster, and it’s still very early. Here are the facts: At his best, Alexander Ring is as good a midfielder as there is in MLS, and he looks like a true offensive threat in year three. James Sands has exceeded all expectations. Minus the embarrassment in Toronto, the backline has looked steady. On their good days, Anton Tinnerholm and Ronald Matarrita are incredibly active on both ends of the pitch. Sean Johnson has been a rock, racking up international caps along the way. Maxi, Héber, Mitriță, and ITS will all eventually take the pitch together, and when they do, this will be a very dangerous team with a very potent attack. Torrent has not lived up to the hype, but disregarding months of planning after a few bad performances, without a solid replacement, and without a backup plan is the wrong decision. For now. Onto Saturday, City will face a tough road test, another Stadium opener with frigid weather expected. History stands in their way, and the injury bug is striking at the wrong time. According to Torrent on Wednesday, Mitriță has an injury that may limit his effectiveness for months. Héber is still only ready for 40-45 minutes of gametime, and Maxi is only at “70-75 percent” health. City will also be without Alexander Callens. NYCFC is in turmoil at the moment, but with other big clubs underperforming around them and only five games into a long season, there is time. While Saturday may produce more of the same from the Pigeons, a roster like this will be poised for an eventual turnaround. The only question is when. On Saturday, April 6th NYCFC will look to turn the 2019 campaign around at home against the Montreal Impact, who are without Ignacio Piatti. When their star isn’t in the lineup, the Impact only win 16% of the matches they play. City will also be without their playmaker Maxi Moralez for a second straight match, hopefully leading to a new look XI after a disappointing month of March. Only losing one of their nine total matches against the Impact, City will be confident in front of their home supporters on Saturday afternoon. New signing Heber will almost certainly debut against Montreal; I believe it would be foolish for him not to start. Although Domè alluded to Heber coming off the bench, another week of Taty or Jesus Medina through the middle would almost certainly escalate fans’ negative opinions of the manager. Alexandru Mitriță has locked down the starting position on the left, and Heber’s addition and strong holdup play will likely create more chances for the Romanian on Saturday. As always, the attacker on the right is in question, with Jonathan Lewis, Jesus Medina, and Ismael Tajouri-Shradi all available as capable options. I expect ITS to start, put together a solid performance, and begin to take hold of a weekly starting spot in the new NYCFC attack. City looked completely lost last week without Maxi in the lineup. To head the midfield and link up play between the defense and the attack, I hope to see Keaton Parks get his first start. Most outspoken NYCFC supporters have been calling on Domè to give Parks a run out for weeks, and if not now, when? Alex Ring and James Sands will both almost certainly start; The question is, where? Alexander Callens will be out with a hamstring injury, and we may see Sands get his first start in the defense alongside Maxime Chanot, but Domè will likely leave the remainder of his midfield unchanged. I expect Ring to remain in his 2019 box-to-box role with Sands spending most of his time just in front of the back four. Ronald Matarrita deserves another start at left back after some questionable performances from Ben Sweat in recent weeks. Mata is at his best at Yankee Stadium, and his service from the left may have newfound meaning with Heber’s aerial ability. Anton Tinnerholm has not been himself yet this season, but Anton has the potential for game changing performances week in and week out. Ibeagha is on this roster for the absences of Maxime Chanot or Alex Callens, and shouldn’t be a liability for the City defense. With Domè’s job security on the line, City should be able to dominate the Impact in the Bronx. If Heber can find his name on the goal sheet, supporters will be forced into at least some optimism for the first time this season. On Sunday, March 17th, NYCFC host LAFC after two disappointing draws to start the season. City’s depth has been evident thus far, with a multitude of capable wingers fighting for starting spots and James Sands seamlessly entering the XI. Sadly, even more evident has been the lack of a true centre forward on the roster. Although the Rumor Mill is hot, City will have to learn to play without a true striker for the time being. Changes must be made in order to keep pace with the high powered attack of LAFC, featuring Carlos Vela, Diego Rossi, Christian Ramirez, and Adama Diomande. Jesus Medina and Taty both played quite poorly last weekend. Facing the attacking firepower that LAFC brings to every match, I expect City to change their shape on Sunday, and return to the 4-3-3 of old. Earlier in the week, I was certain that Ismael Tajouri-Shradi would finally get his first start of the season on Sunday. After criticism from his manager and a Questionable tag ahead of the match, this is now unlikely. With that in mind, I expect City to play Maxi through the middle as a false 9, providing service to Alexandru Mitriță on the left and Jonathan Lewis on the right. City will need to create chances on Sunday, and Lewis seems to always find himself in front of the net. Although his end product last weekend was not good enough, I expect Domè to give Jonathan Lewis another run-out. Domè was happy with the team’s performance for most of last week’s match, but preached the importance of possessing the ball. I believe to win possession on Sunday, another midfielder will be necessary. I expect Keaton Parks to start in a more advanced midfield role alongside Alex Ring, with James Sands spending most of his time between Callens and Chanot. Parks’ ability to pass in the final third might be exactly what City needs to refine their end product, and his size will give NYCFC an aerial option on set pieces that they didn’t have against DC. I expect the backline to be unchanged after a solid performance at home last week. In their only meeting to date, NYCFC and LAFC played to a 2-2 draw at Banc of California Stadium. The game started very well for City, with a VAR Handball leading to a penalty kick, headed in by David Villa off a rebound. LAFC would tie the match at 1-1 soon after, with Sebastien Ibeagha unluckily redirecting a corner into his own net. The game would stay tied at ones until the 66’. Carlos Vela was the first to a loose ball, and scored on his right foot to the glee of the home supporters. City responded quickly though, with an awkward cross from Anton Tinnerholm leading to an amazing finish from Ismael Tajouri-Shradi on the near post. Jesus Medina and Jo Inge Berget both missed clear cut chances which could have won the match for NYCFC, but the back and forth contest finished with both sides taking a point. Carlos Vela has been the best player on the pitch in his first two games of the season. WhoScored’s Man of the Match in LAFC’s 2-1 win over Sporting Kansas City, and tallying a goal and two assists in a 4-1 victory against the Timbers, Vela has been a revelation since he arrived in MLS. To scare City fans even more, of Vela’s fourteen goals last season, ten came away from home. Just as he has in 2019, Vela started 2018 hot as well, leading LAFC to the best first ten games for an expansion side in MLS history. The current MLS Player of the Week will be a serious problem for City on Sunday. On Sunday, March 10th, NYCFC host D.C. United for City’s Home Opener. After a disappointing draw last Saturday, our boys in blue return to the fortress that is Yankee Stadium, where City lost only one match in seventeen played last season. Domè is a tinkerer. Especially at Yankee Stadium, City’s skipper will look to change the team’s shape and tactics throughout the match. With that in mind, I expect NYCFC to line up in an ultra-fluid and ultra-attacking 4-1-4-1, merging into a 5-2-3 in defense. City is at full strength with Ronald Matarrita back from another brief injury, but I expect the backline to be unchanged from Saturday. With that being said, I do believe that Alex Ring will start where James Sands did against Orlando, just in front of the two centerbacks. At Yankee Stadium, however, Callens, Ring, and Chanot will likely form a back three at times, allowing Ben Sweat and Anton Tinnerholm to make overlapping runs in the attack. Regardless of your opinion on the dimensions of Yankee Stadium, NYCFC are a much better team at home with a box to box midfielder, whose passing in the final third is essential to linking up the defense with the attack. I believe that Keaton Parks is the man for the job, grabbing his first NYCFC start in front of the home supporters. City’s roster consists of a multitude of attacking options, it’s up to Domè to choose which to start. To make his decision a bit easier, I believe NYCFC will start with four true attacking threats on Sunday: Maxi Moralez, Alexandru Mitriță, Jesus Medina, and Ismael Tajouri-Shradi. I expect Medina and ITS to play tight to the touchlines, forcing the DC defense to make crucial decisions once their high-press breaks down. Mitriță can play through the middle, but the fluid attack will find our new DP on the left for a good portion of the match as well. This season, I envision NYCFC at their best at home, when Mitriță and Maxi are given freedom in their positioning, with the rest of the attack high-pressing their opponents, preventing stars like Wayne Rooney and Lucho Acosta from possession of the ball. Jonathan Lewis’ role this season is a controversial topic. Regardless, I expect Jonathan Lewis as a late game sub at Yankee Stadium this season, a role he thrived in last season in the Bronx. Another possibility for City on Sunday is giving Eben Ofori another start after his great goal last weekend in place of Jesus Medina. At times last season, Ofori would begin at the left midfield role at home, dropping deeper into the midfield in defense, perhaps even man-marking one of DC’s many dangermen. On October 21st in NYCFC’s second to last match of the season, City fell 3-1 away to a red-hot DC United. DC started the match in style, with Lucho Acosta’s tight dribbling leading to an easy finish for Rooney. Chances were few and far between in the first half for the Blues, and Acosta would soon make it 2-0 on a shot from just outside the box. A penalty slotted away by Rooney killed the match off in the second half, as David Villa’s consolation goal meant nothing for a City team with one win in their last nine. The backline will likely look identical to last season at full health, with Sean Johnson surely between the posts. Ronald Matarrita may crack the eleven in place of Ben Sweat, but I expect Sweat to build off his surprising 2018 with an even stronger 2019. City are likely to return to their trusted centre back pairing of Maxime Chanot and Alex Callens, but Sebastien Ibeagha always has a chance to start ahead of either. Anton Tinnerholm, who arguably looked his best under Domè, has the right back position locked down again this season. Leading the team with 24 goal contributions in his second full season in the big apple, Maxi Moralez will be leaned on in 2019. A key to NYCFC’s distribution and identity in building from the back, arguably no player is as important to the club for this season. I predict new captain Alex Ring to begin the season in the lone defensive mid role, but I would not be surprised to see a double pivot employed by Domè, giving Ring license to get forward and do more things like this. City’s midfield must deal with a tremendous loss in Yangel Herrera, and addressed the problem by adding Keaton Parks on loan from Benfica. Likely spending most of his time between Moralez and Ring, Parks’ passing will be essential to City’s desire for possession of the ball. More of a box-to-box midfielder, he doesn’t seem to have the same defensive talent that hard-nosed Herrera prided himself in, but his passing and movement in the final third should be a joy to watch this season. The loss of David Villa has led to great uncertainty this offseason, and while City have still yet to sign a true Centre Forward, Alexandru Mitriță will certainly help in the goal scoring department. I predict Mitriță will play through the left to open the season, with Ismael Tajouri-Shradi opposite him on the right. ITS wrote his name on the goal sheet eleven times last season, and deserves the run out on Opening Day. Lastly, I predict that Valentin ‘Taty’ Castellanos will start through the middle, although the attack will almost certainly remain dynamic throughout the match, with the front three interchanging positions constantly. Do not be surprised, however, to see Jesus Medina or Jonathan Lewis get the start up front. *The Outfield’s Formation Breakdown is a fantastic read for more in depth discussion on City’s potential shape not only on Saturday, but for the rest of the long season as well. Also check out the NYCFC Season Preview on American Soccer Analysis to get up to speed before Saturday’s season opener. Major League Soccer’s third most expensive signing in its history, City’s new Designated Player, Romanian International, a young Giovinco, whatever you want to call him, Alexandru Mitriță has huge shoes to fill. The Romanian is a lethal forward with 12 Goals and 4 Assists in 16 matches this season, who is expected to take set pieces with the departure of David Villa. With NYCFC’s attack likely to be incredibly fluid all season with a multitude of options at each position, Mitriță is expected to play through the middle, with some time also being spent on the left. Unlike Maxi Moralez, he tends to stay in the final third of the pitch. Mitriță should find his name on the score sheet early and often. The former Manchester United standout Nani was expected to finish his career at Sporting Lisbon in Portugal, back where he started. Many were shocked, however, when he made his move to Orlando City while in the midst of a great season in Liga NOS, with seven goals and four assists in eighteen league matches. All eyes will be on Nani in his first match, where he will likely line up on the left and face Anton Tinnerholm head on. Ahead of Wednesday’s Knockout Round, most fans would argue that the same starting eleven that defeated the Union just three days ago should start again. I find it naive to think Jim Curtin’s side will not adjust, if not positionally then certainly tactically. Domè, City’s supposed tactical advantage, should be one-step ahead. With NYCFC finally at full strength, the options are plenty. At Yankee Stadium, in front of City supporters, there are no more excuses. I expect the front three to feature two changes from Sunday’s win. Jesus Medina received mixed reviews from not only supporters this weekend but his manager as well, and I expect him to start on the bench. Ismael Tajouri-Shradi has been a revelation this season, and it would be a crime not to feature the eleven goal scorer in the Knockout Round. David Villa has scored in four of his last six matches, including two in a row. A confident captain should produce results. On the left, I expect Ronald Matarrita to drop back into defense, and Valentin Castellanos to get the starting nod. In per-match statistics, ‘Taty’ averages four shots a match, placing him in elite company; just ahead of Zlatan Ibrahimovic and just behind Miguel Almirón. Looking at expected goals yields the same result, with Castellanos sandwiched between Gyasi Zardes and Alberth Elis, tied with Zlatan in the important statistic. Castellanos deserves the start, and I believe Domè will give it to him. NYCFC is at their best when Maxi Moralez, Alexander Ring, and Yangel Herrera are together in the middle. Advanced statistics help tell the story of why the midfield trio have been so successful. In the defensive third of the pitch, Alexander Ring ranks second in MLS in passes completed per match. In the middle third of the pitch, Yangel Herrera ranks fourth in MLS in passes completed per match. In the attacking third of the pitch, Maxi Moralez has completed the fourth most passes in the league. Showcasing all three players together lends itself to City’s possession based style, and limits the opposition’s chances. City will be almost guaranteed to see the majority of the ball on Sunday, and as long as their fluid and dynamic first-choice midfield stays intact. The midfield was the team’s strength on Sunday, and I expect nothing less than an amazing performance from three of City’s most influential players on Wednesday. Ben Sweat has been an amazing value for NYCFC, and a somewhat under-appreciated constant on a back line plagued by injury this season; Alexander Callens, Maxime Chanot, and Ronald Matarrita all missed time. That being said, Sweat tends to make a few mistakes each start, which leaves City exposed. Domè’s affinity for Matarrita should shine through on Sunday, and I believe that the Costa Rican international will provide a vintage performance from left back. Partly due to his appearances as a winger, and partly due to his aggressive attacking style, Matarrita is one of the most productive wingbacks in the league. At home, Mata should be ready to roll. We expect a victory and nothing less on Wednesday, then our sights can be set on a reeling Atlanta United. This may just be City’s season after all...Come on New York! Follow Nick Fiorino on Twitter at @stretch_fio and The Third Rail at @ThirdRailSC. Interested in learning more about the Third Rail? Visit our website at thirdrail.nyc for merchandise, weekly game previews and more. Interested in joining? Click here. It has not been easy watching recent NYCFC performances. The team has simply not been been good enough, with the last truly good match coming in the second week of July. The thrill of three home victories by a combined scoreline of 6-0, including a Derby win and amazing displays from the club’s youth, has not been matched in over three months. Luckily, the playoffs are nearly upon us. When the final whistle is blown on Sunday, regardless of result, the season will undergo a reset, and the last twelve weeks of mediocrity will mean little in comparison to the Knockout Round. With the final game of the season readily approaching, here are the four things to focus on. Obviously, a positive result on Sunday is City’s first priority. Barring a disaster, City will have the luxury of home field advantage for the Knockout Round. Who they will host, on the other hand, is completely up in the air. Even a draw would be in City’s favor, almost guaranteeing avoiding red-hot DC United in the play-in game. Seeding changes aside, NYCFC need a result for confidence and momentum. Winning only two of their last twelve matches, the boys in blue simply cannot let their disappointing play continue into November. While the three points are certainly important, NYCFC must address the underlying issues that have plagued this team for months. NYCFC’s tried and true formation since early into Patrick Vieira’s tenure with the club, the 4-3-3 would force Domè to pick two of City’s deep selection of wingers to start alongside David Villa. Youth, pace, and a secondary goal scorer would relieve pressure for Villa and allow the Blues to use the width of the entire pitch, and keep the opposition compressed into their own end. With Yangel Herrera expected to return to full fitness come playoff time, Ebenezer Ofori would likely be relegated to substitute duties. Ben Sweat would almost certainly get the nod at left back, providing coverage at the back to stop the counter. With a full squad to select from, Domè may opt to line up in the 4-3-1-2 Diamond formation seen sparingly throughout the year. While the formation would not showcase any wingers, limiting Jesus Medina, Taty Castellanos, and Ismael Tajouri-Shradi from starting, the diamond will pack the midfield and limit the counter-attack. Jo Inge Berget and David Villa would work in a front two with Maxi not far behind, creating an interesting front three. Ronald Matarrita would likely start at left back opposite Anton Tinnerholm, and the pair would have the independence to join the attack from the wings. Lastly, the fluidity of the midfield would give both Yangel Herrera and Alex Ring the opportunity to join the attack without a concern for the counter-attack. NYCFC’s identity as a club from day one has been rooted in possession-based football with dynamic attackers. Before the tail end of this season, City’s style of play was the one constant on the pitch. For any chance on Sunday and in the playoffs, Domè must return to the style that has been a part of NYCFC from the beginning. In City’s first three seasons of existence, the missing piece of the puzzle was a secondary scorer opposite David Villa. Now, with Ismael Tajouri-Shradi, Maxi Moralez, and Jesus Medina combining to score 25 goals to Villa’s 13, there should be no excuse. The current roster has a perfect mix of experience and youth, and has lost only once at home all season. This is the same NYCFC that outplayed Atlanta United and beat the Red Bulls at Yankee Stadium. With some fine tuning, City can beat anyone in this league. The pessimistic, worst case scenario must also be addressed. There is a real possibility that NYCFC cannot turn back to the form of months ago, lose on Sunday, and subsequently are knocked out early into the playoffs once again. If this is the case, real questions need to be asked during the offseason. First, City’s youth was mismanaged this season by both managers. Jonathan Lewis did not play nearly as much as he should have, and some player selections on game days were questionable at best, and preposterous at worst. We saw players like Eloi Amagat, Rodney Wallace, and Tommy McNamara given opportunities time and time again over promising young talent. Domè has said that he “needs two wingers”, yet has had Jesus Medina, Ismael Tajouri-Shradi, Taty Castellanos, and Jonathan Lewis available for most of the season. Shifting focus to our manager, some fans will certainly be clamoring for a change. That being said, Domè needs and deserves more time than he has been given to implement his style and add talent to the squad. Nonetheless, NYCFC has been mismanaged at times this season, and the results have not been good enough. Under Patrick Vieira, no player’s spot in the starting eleven was guaranteed, and it showed on the field. Domè must motivate his players for every match, regardless of occasion, home and away, which he simply has not done in recent months. With all this in mind, NYCFC have as good a chance as any to make their run this season and lift MLS Cup. The business-portion of the season has almost arrived. Will it be more of the same from New York’s team? Or will fans finally get the playoff victories they deserve? We’ll find out soon enough. On Saturday September 22nd, NYCFC will travel North to face the Montreal Impact. Winless in their last five, and with only one win in their last eight matches, City need to turn the tides before things really get out of hand. With a combined 83 shots in their last three matches and only two goals, the boys in blue will have to be more clinical. Embarking on three games in seven days, results, and not just “good performances”, will be paramount and an indicator of City’s post-October prospects. With a full selection of players at his disposal, Domè will have many decisions to make. While the shape of the XI will be fluid for much of the match, I believe NYCFC will line up in their usual 4-3-3 to start. Jo Inge Berget should regain his starting spot, and will spend some time wide left, but most of the match at centre-forward next to David Villa. Ismael Tajouri-Shradi should start on the wing if the 4-3-3 is decided upon. The midfield will finally get back to normal, with Alex Ring, Ebenezer Ofori, and Maxi Moralez playing their normal roles. The back four will likely be comprised of Ben Sweat, Maxime Chanot, Alexander Callens, and Anton Tinnerholm, but do not be surprised for Sebastien Ibeagha to hold his place. If Domè decides on the 4-4-2 diamond, expect Tajouri-Shradi to see the bench for a more defensive-minded option. To put it plainly, City have not been good enough in recent matches. The months of August and September have been brutal with a record of 1-3-3, totaling only six points. The Impact are on the complete other side of the spectrum. Montreal has lost only one of their last six, including a 3-0 victory over the Red Bulls and a 4-1 win away in Philadelphia last Saturday. A team focused on putting away chances on the counter-attack, Montreal will be an incredibly tough opponent. Who else could it be? Ignacio Piatti has had another spectacular season in MLS, with 13 goals and 12 assists thus far. Of his 13 goals, 11 have come at home. He ranks ninth in the league in expected goals plus assists, leads Montreal in shots on target, key passes, and fouls suffered, and leads MLS with five game winning assists. Quite possibly the most fun player to watch in MLS, Piatti is as important to Montreal as any player to any team. Fan favorite and one of the best young talents at the club, Jonathan Lewis has been loaned to Louisville City FC for the remainder of the USL season, concluding on October 13th. Lewis will be back in New York for the final two matches of the MLS regular season and the playoffs. Earlier this season, James Sands was also sent on loan to Louisville, and was incredibly effective in all three appearances. This move initially sent City supporters in an uproar, but in actuality, Lewis will miss only three matches due to an almost month-long break in matches from September 29th to October 21st. UPDATE: On Wednesday night, Lewis made his debut and contributed an assist in 62 minutes on the pitch in an all-around great performance. On Saturday, September 8th NYCFC will look to bounce back in front of the home supporters when Wayne Rooney and DC United come to town. Four games without a win and arguably seven games without a good performance, City need three points. The form could not be more different between the two clubs, but anything can happen in the Bronx. With an expected crowd of 30,000+, City will certainly have the 12th man on their side. A lineup will be hard to predict when a squad is short seven players. Ebenezer Ofori, Ismael Tajouri-Shradi, Maxine Chanot, Rodney Wallace, Jo Inge Berget, Jesus Medina, and Alex Ring will all miss Saturday’s important match. As James Sands proved Wednesday night, however, now is the time for players to prove their worth for the final stretch of the season and into the playoffs. I believe that last week’s diamond formation will make another appearance on Saturday, giving us a front three of David Villa and Valentin “Taty” Castellanos with Maxi Moralez behind. Without Alex Ring, James Sands should again sit in front of the back four, with Ronald Matarrita and Eloi Amagat on each side. A back four of Ben Sweat, Alexander Callens, Sebastien Ibeagha, and Anton Tinnerholm is expected. Losing their first match in the Bronx in just under a full year on Wednesday, NYCFC are in horrific form. Losing two in a row for the first time since April of 2016, Domè needs to find answers. DC United have won four of their last six games, and are coming off an impressive 3-1 win over Atlanta. Surging up the Eastern Conference table, a win over NYCFC would be essential to DC’s playoff hopes. Making his long-awaited first start for City on Wednesday, James Sands showed us what the hype was all about. With his calmness on the ball and head always on a swivel, it is no wonder why Domè has given him such high praise. Our #6 of the future will have a huge responsibility on Saturday with Alex Ring suspended and Ebenezer Ofori away on international duty. Likely the defensive head of our midfield, Sands’ play will dictate much of the afternoon for City. Although Wayne Rooney has been in the headlines, Lucho Acosta has been just as important in DC’s surge in the standings. With Rooney starting as a true Centre-Forward, Acosta now has the space and the service to showcase his talents, cultivated at Boca Juniors as a teen. Scoring twice against Atlanta last week, both assisted by Rooney, Lucho will be a clear danger. Although scoring all seven of his goals at home, his seven assists on the road is tied with Kaku for first in the league. Proving he can score and supply his teammates, Acosta will be the key for DC United on Saturday. On Wednesday, September 5th NYCFC thankfully return home to the Bronx for an Eastern Conference clash against the Revolution after a terrible performance in Columbus. City will be as short-handed as ever before for the next two home matches, with the International Call-ups of Maxime Chanot, Ebenezer Ofori, Ismael Tajouri-Shradi, and Rodney Wallace. The injury report is full as well with Jo Inge Berget and Jesus Medina both unavailable, and Alexander Callens still questionable. Regardless of the obstacles, a win over the Revs is necessary to get City back onto form. Call it wishful thinking, but I believe that Jonathan Lewis and James Sands will both get the start on Wednesday. I absolutely would not be surprised to see Ronald Matarrita in the attack and Eloi Amagat or Kwame Awuah in the midfield, however. A front three of David Villa, Valentin “Taty” Castellanos, and Jonathan Lewis would be a dream for City supporters, and I hope that Domè makes the correct decision. The backline of Ben Sweat, Alexander Callens, Sebastien Ibeagha, and Anton Tinnerholm should start as well. If Callens is forced to miss the match, however, expect Ben Sweat to move centrally and Ronald Matarrita to start at left-back. Coming off quite possibly the most disappointing performance of the season, NYCFC luckily have a quick turnaround to turn their fortunes. Winning only one of their last six games, City need six points from the next two matches. Winless since June, the Revolution have lost six of their last nine. Only six points from the sixth position in the East, however, New England still has everything to play for. NYCFC failed to make up ground on the top two in the East, both who also lost this past match week. With one game in hand on the Red Bulls, however, the next two home matches will be incredibly important results for City. Jonathan Lewis deserves to start this week for NYCFC; If not now, when? With Jo Inge Berget and Jesus Medina sidelined for the near future, Ismael Tajouri-Shradi with his national team, and an aging David Villa playing three games in a week, now is the time. Lewis has been impressive in every appearance thus far in 2018, and if he doesn’t get time this week, this year could be the last we see of Lewis in the Bronx. Diego Fagundez, who opened the scoring in his last meeting against NYCFC, has had another great season in MLS. Tallying seven goals and eight assists, he has been a bright spot in a disappointing season for the Revs. According to American Soccer Analysis, Fagundez is fourth in the league in key passes with 70, eleven behind Maxi Moralez. Sixth in expected assists and starting in 25 of the Revolution’s 26 games, Fagundez has been a constant in a season without many for New England. On Wednesday, August 22nd a shorthanded NYCFC side will return home to the Bronx for their most important game of the season thus far, the final regular season installment of the Hudson River Derby. With City four points behind Atlanta and a lone point behind our cross-river rivals, nothing short of all three points are necessary to remain in the elite company of MLS. NYCFC’s injury report headed into the Derby is full. Alexander Callens and Jesus Medina will miss the match due to injuries sustained on Saturday night. Valentin ‘Taty’ Castellanos has been dealing with a quad injury and will not be available for selection, alongside Ronald Matarrita, who picked up a red card on Saturday. City’s depth will be tested, and hopefully the youngsters can make the 18. With this in mind, I expect Jo Inge Berget, David Villa, and Ismael Tajouri-Shradi to start in the front three. David Villa will almost certainly be on a minutes restriction post-injury, but I expect him to make an serious impact on the match, even if only for 45-60 minutes. The midfield should remain intact, while the back four is practically set with Ben Sweat, Sebastien Ibeagha, Maxime Chanot, and Anton Tinnerholm. The bench should finally feature Jonathan Lewis, who has not made the eighteen in two consecutive matches. Although City are 2-1-2 in their last five, they have arguably been outclassed in four of those matches, with the fifth being an unsatisfying draw at home. Luckily for City, a win would certainly raise the spirits of the boys heading into the final eight matches of the regular season. The Red Bulls have been in good form for most of, if not the entirety of the season so far. Coming off a 2-2 away draw in Vancouver on Saturday, Chris Armas’ side will look to widen the gap between second and third place in the East on Wednesday night. The play of Maxi Moralez this season cannot be focused upon enough. His work on both ends of the pitch has been immense. First in Major League Soccer with 80 key passes, Maxi’s eight goals and twelve assists have made him team MVP thus far. His build-up play has been essential, as he is ranked third in the league in total passes in the middle and attacking thirds of the pitch. Setting the tempo of the match is Maxi’s forte, as he has suffered the third most fouls in the league as well. ‘El Frasquito’ has proven essential to City’s success in a season plagued by attacking injuries. Who else could it be? The Red Bull attacker has had another season in elite goal scoring form, and will look to add on another at Yankee Stadium. Tied for second in MLS in goals with 15, Wright-Phillips has also tacked on 7 assists. Most dangerously for NYCFC, American Soccer Analysis has given BWP a 0.30 ‘solo’ rating, which is second in the league for double-digit goalscorers behind Ismael Tajouri-Shradi. Simply, the stat is a percentage of shots taken that were unassisted. Wright-Phillips capitalizes on defensive mistakes, and is clinical in crunch time situations. Without Alexander Callens in defense for the first time in two seasons as a steady passing target in the back, NYCFC must be perfect in build-up to have a chance on Wednesday night. On Saturday, August 18th, NYCFC travel to Philadelphia to face the fifth place Union. With the Red Bulls coming to the Bronx on Wednesday and the final stretch of the season in sight, three points are necessary to keep pace in the Eastern Conference and the Supporters’ Shield race. NYCFC’s injury woes continue, with newcomer Valentin “Taty” Castellanos out with a quad injury on Saturday. On the bright side, Sean Johnson is likely to return in goal after missing the last two matches. With the last regular season Hudson River Derby match of 2018 on deck at Yankee Stadium, the boys in blue will look to impress and fight for a place in the team on Wednesday. I believe that Jesus Medina, David Villa, and Ismael Tajouri-Shradi will start up front, but Domè may give Rodney Wallace, Jo Inge Berget, or Jonathan Lewis, who did not even make the 18 last week, the spot start. I expect the midfield to remain unchanged. Ben Sweat should get the nod after a rather pedestrian performance from Ronald Matarrita last weekend. Lastly, Sebastien Ibeagha has started the last two away from home for City, and I believe that he starts again in Philly. Following a disappointing draw at home to a rather weak Vancouver side, NYCFC responded in Toronto with all three points against the reigning MLS Cup Champions. 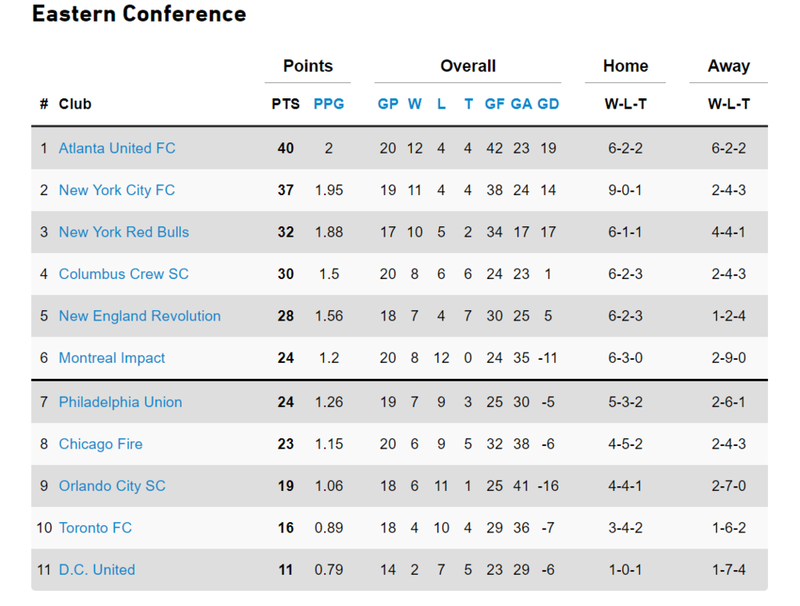 Although the Union’s season has had it ups and downs, they lie in fifth place in the Standings. Winning three of their last five games, all on the road, the Union look to be heading in the right direction at the tail end of the season. On June 2nd of last year, NYCFC defeated the Philadelphia Union by a score of 2-1. The first half was full of City chances, with Andre Blake making tremendous saves throughout the 45’. The score remained 0-0 until Fafa Picault scored for the Union off the counter, giving Philadelphia a 1-0 lead. Many will remember this match for the unlikely NYCFC goal scorers late in the match, with Maxime Chanot scoring a rare header from a corner for City in the 80’. Then in the 84’, Alexander Callens scored after a scramble in front of net, giving NYCFC the 2-1 lead, which they held onto. Quite possibly the Newcomer of the Year, Ismael Tajouri-Shradi has been nothing short of incredible for City this season. NYCFC’s one constant critique since day one has focused on a secondary goalscorer to David Villa, and Tajouri-Shradi has certainly accomplished this. His goal scoring efficiency is unrivaled in MLS, showcased by his 10 goals on only 15 shots on target. He also ranks first in the league in goals minus expected goals. Tajouri-Shradi is not only a key to this match, or the rest of this season, but to the future of NYCFC’s attack. CJ Sapong is having an interesting season to say the least. A proven goalscorer at the MLS level, his three goals and one assist in 22 games played are shocking statistics. Sapong has the lowest goals minus expected goals in MLS, which usually means that a player is due a goal sooner rather than later. Sapong’s eleven expected goals plus assists places him in elite company, and Saturday may be the day that Sapong breaks out in 2018. Before the Game Preview, Congratulations are in order for Adrian Conoboy, the MLS Works Community MVP for 2018! Adrian has done incredible work and is an amazing representative of the club. You can find his nonprofit charity We Can Kick It on Twitter, and on behalf of the Third Rail, we thank Adrian for his unbelievable effort not only this All-Star week, but for years to come as well. On Saturday, August 4th NYCFC returns home to face the Vancouver Whitecaps. As every fan must know, City’s undefeated season at Yankee Stadium thus far (10-0-1) will be on the line. The boys in blue will look to bounce back after a tough loss in Seattle last week, but luckily, NYCFC have not lost back-to-back matches in the last two full seasons. With David Villa suspended due to his All-Star absence, the NYCFC attack will again be forced to adapt. I believe the best course of action is for Jo Inge Berget to start up front with Ismael Tajouri-Shradi and Jesus Medina alongside him on the wings. Do not be surprised for Rodney Wallace or Ronald Matarrita to grab the start, and also expect to see newcomer Valentin Castellanos off the bench for his NYCFC debut. Although playing for most of the first half on Wednesday night in Atlanta, Alexander Ring is expected to start and play like his usual self next to his midfield partner Ebenezer Ofori. Maxime Chanot should reclaim his starting spot in the backline, and July’s NYCFC Player of the Month Anton Tinnerholm will look to attack and net his fifth of the season from right back. Lastly, the Injury Report released Friday informed the fans of Sean Johnson’s training injury sustained during the week, and from Domè’s comments, I believe that Brad Stuver will get the start between the posts. Following their four game home stand that resulted in four victories, City split last week’s road trip, defeating Orlando yet falling to the Sounders. Although losing four of their last seven games, the Whitecaps are coming off their most high-profile win of the season against the surging Minnesota United. Their away form has been quite poor on the season, however, losing their last three away from home by an aggregate score line of 9-1. On July 5th of last year, NYCFC traveled to BC Place in Vancouver and lost 3-2. An early giveaway by City’s defense led to a Fredy Montero goal in the second minute. The game calmed until the 33’, where the patented NYCFC corner technique led to a scramble in front of goal, which was finally put away by Maxime Chanot, tying the match at one. Tommy McNamara won a penalty five minutes later, which David Villa buried, giving City a 2-1 lead into halftime. The second half was filled with Vancouver Whitecaps chances, with left back Jordan Harvey volleying an equalizer from a well worked cross. The game was all but over until Yordy Reyna scored the winner in the 88’ on a free header in front of goal. After leading 2-1, City left Vancouver without any points. A win on Saturday would place NYCFC one point behind league leaders Atlanta United in not only the Eastern Conference Standings, but the Supporters’ Shield race as well. NYCFC’s 1.95 average points per game ranks second in MLS, alongside the Red Bulls. At the All-Star break, NYCFC’s MVP has surely been Maxi Moralez. El Frasquito has had a breakout season thus far, tied for second in the league with his 11 assists. Moralez has also been the catalyst for City’s home form on the season, with his 8 home assists only one behind the league lead. Maxi plays all over the pitch, assisting in build up, speeding up the tempo in the attack, while also slowing down play with his 54 fouls suffered, fifth in MLS. Looking at advanced statistics, Moralez stacks up alongside elite company in 2018, ranking sixth in expected goals plus assists with just over 13. With David Villa injured for much of this season, Maxi has stepped up and has been more than City fans could have hoped. Rather obviously, Vancouver’s player spotlight will be 17 year old sensation Alphonso Davies. Recently sold to German super club Bayern Munich for an MLS record $13.5 Million with bonuses that total $22 Million, Davies lives up to the hype. Last week, the Whitecaps defeated Minnesota United, with Davies tallying two goals and two assists. The wonderkid is a sight to see, and the bright lights at Yankee Stadium may bring out the best of the budding superstar. On Sunday, July 28th NYCFC travel cross-country to face the Seattle Sounders. After earning the victory Thursday night in Orlando, City will look to earn six of a possible six points on their two game road trip and finally improve upon their rather pedestrian away form on the season. Although beating the Lions rather easily, Domè was not happy with the performance. Without David Villa due to injury and Alexander Ring due to yellow card accumulation, City’s depth will be tested against a Sounders squad that is undefeated in their last five matches. Although David Villa has not made the trip to Seattle, the rest of the attack seems to be at full strength after substitute appearances from Jo Inge Berget and Ismael Tajouri-Shradi. I believe that both will start on Sunday, alongside Ronald Matarrita and Maxi Moralez in the attack, sending Rodney Wallace to the bench. With Ring out of the lineup, Domè implied that Kwame Awuah would get the start, and I believe that he should as well, alongside Ebenezer Ofori following his most impressive match for the club thus far. Lastly, I believe that Sebastien Ibeagha will get a spot start, but do not be surprised to see the backline unchanged after four straight clean sheets. In the midst of their longest win streak of the season, NYCFC seem to be hitting their peak form. Missing some key starters, City have been leaning on Maxi Moralez in the attack, Alexander Callens and Sean Johnson in the back, and super-sub Jonathan Lewis, and all will be essential to keep the streak alive on Sunday. Although still tenth in the Western Conference, the Sounders are certainly trending in the right direction. Currently unbeaten in five with three wins and conceding only two goals along the way, the Sounders finally have a winning formula. With new Designated Player Raul Ruidiaz set to make his second start, and Roman Torres set to return to the defense, Seattle believe they can earn the three points at CenturyLink regardless of their opponent. On June 17th of last season, City hosted the Sounders in a match many will remember as the “rain game”. The first half was characterized by sloppy build up play and an almost unplayable surface due to the weather. Cristian Roldan opened the scoring in the 40’, stunning City supporters. Just before half, David Villa smashed the crossbar on what would have been a goal of the season, but NYCFC went to the break trailing 1-0. David Villa won and buried a penalty five minutes into the second half, and City never looked back. With only fifteen minutes left, Jack Harrison sent in a great cross, which David Villa scored first-time on a beautiful finish, ending the match 2-1 in the favor of the boys in blue. Since his move from Stuttgart, Ebenezer Ofori has steadily improved for NYCFC. On Thursday, Ofori dominated the Orlando midfield and was great on both sides of the ball. Without Alexander Ring on Sunday, Ofori may be asked to take command of Ring’s all-important defensive midfield duties, an incredibly difficult task. Ofori’s performance will be essential if City are to earn all three points. With no player with more than five goals scored, yet twelve different goal scorers on the season, Seattle has gone with a team attacking approach. Designated Player Raul Ruidiaz hopes to change that in his second start for the club on Sunday. The “Peruvian Messi” is a proven scorer, putting in great performances for the national team, Primera Division in Chile, and Liga MX. Scoring in his first match for Seattle on Wednesday, Ruidiaz was dangerous all night, and he is certainly the focus for NYCFC on Sunday. NYCFC have made two new signings in the last five days, both who are sure to see time on the pitch down the key final stretch of the season. First on July 25th, NYCFC announced the transfer of 33 year-old Spanish midfielder Eloi Amagat. Familiar with him from his time at Girona FC in Spain, Domè has spoken highly of Amagat. Although a likely replacement for Yangel Herrera, the players could not be more different. Amagat will fight for playing time with Ebenezer Ofori and likely be a creative attacking presence to the usual defensive two that City have employed this season. Secondly on July 27th, NYCFC announced the loan of Valentin Castellanos, a 19 year-old Argentinian from City Football Group owned Torque in Uruguay’s Primera Division. Winning Young Player of the Month for the league in June, Castellanos is a right-footed winger who prefers to play on the left. Adding Castellanos into the young core attack alongside Jesus Medina and Jonathan Lewis, City’s depth is now rivaled by its youth as well. Expect Castellanos to be initially used as Lewis is used; a super-sub with serious pace and one vs one ability. On Thursday, July 26th, NYCFC will travel to Orlando to face a club that they have already beaten twice on the year by an aggregate score line of 5-0. After twelve days off, NYCFC will face Orlando City, then onto Seattle on the weekend for a Sunday afternoon contest with the Sounders. With the trio of David Villa, Ismael Tajouri-Shradi, and Jo Inge Berget finally back at training and listed as Questionable on the injury report, it is up to Domè to decide how to ease the three attackers back into the team. I believe that the best course of action is to give Villa and Tajouri-Shradi the start on Thursday, and allow Berget to play up front against a physical Seattle team on Saturday. Jesus Medina’s recent performances warrant another start, and we will almost certainly see Jonathan Lewis off the bench. The midfield three should stay intact and the backline of Sweat, Chanot, Callens, and Tinnerholm should remain as well. Do not be surprised for Rodney Wallace to grab minutes up front, or Ronald Matarrita and Sebastien Ibeagha to start in the back. Although entering the game on a three match win streak, NYCFC will look to change their away form on the year under Domè. City are 2-4-3 away from the Bronx this season, which is undoubtedly disappointing. Facing back-to-back away games in a span of four days however, the boys in blue will look to turn the tides. Losers of ten of their last eleven games, Orlando have been in horrific form. Coming off a heartbreaking added time long-shot from Wil Trapp to lose 3-2 to the Crew, Orlando are desperate to find points and get themselves back in the playoff race. In NYCFC’s second meeting with Orlando this season, City began just as they did in the first match, with an opening goal. The boys took an early lead off a curled Ismael Tajouri-Shradi shot from inside the 18. The second half started poorly for NYCFC with Alexander Callens bringing down Sacha Kljestan in the box for a penalty. Luckily, Kljestan missed off the post. In the 78’, Tajouri-Shradi scored his second, fooling Joe Bendik on a free kick whipped with power into the area. This match was one where Jonathan Lewis made his presence known for one of the first times this season, beginning a chaotic sequence in front of net that included two shots off the crossbar. The play was finally put away by Maxi Moralez, finishing off the game 3-0. Only 4 points behind Atlanta United in the Supporters’ Shield race with two games in hand, every match, regardless of opponent, is of the utmost importance to City. On the other side, Orlando sit six points out of a playoff position, and hold the worst goal difference in Major League Soccer with a minus 16. NYCFC is coming off quite possibly the most successful week in the history of the club, and most fans will point to Jonathan Lewis as the reason why. The 21 year old winger has taken the opportunity given to him by Domè, and has disappointed no one. Lewis began the week with the game winning assist in the Derby, followed by a headed goal against Montreal, and topped it off with a composed assist against the Crew. He leads Major League Soccer in expected goals plus assists per 96 minutes from players with 100+ minutes, and makes his mark whenever he steps foot on the pitch. While fans will call for him to start, Lewis has thrived in the “super-sub” role, and his speed against tired legs of defenders late in games is irreplaceable. If his red-hot form continues, the sky's the limit. Familiar to City fans from his time in New Jersey, Sacha Kljestan has been one of the only bright spots for the Lions this season. The attacking midfielder ranks sixth in MLS in key passes, and is coming off arguably his best match of the season, tallying a goal and an assist in only sixty minutes. No player is more important to the success of Orlando City than Sacha Kljestan. On Saturday, NYCFC will look to win their third match of the week in the Bronx against the Columbus Crew. A victory would place the boys in blue tied atop the Eastern Conference and level on points with Atlanta United in the chase for the Supporters’ Shield heading into a twelve-day break. Although three key players for NYCFC are listed as questionable on Saturday, I believe it is best to rest Jo Inge Berget, David Villa, and Ismael Tajouri-Shradi, especially with a twelve day break on the horizon. That leaves Jesus Medina, Rodney Wallace, and Ronald Matarrita to man the attack alongside Maxi Moralez. The front four will likely be fluid throughout the match, with each dropping into the midfield at times to facilitate possession. Matarrita deserves the start after making a positive impact off the bench in each of the last two matches, highlighted by his goal on Wednesday night. Maxime Chanot should reclaim his starting spot in the back alongside Alexander Callens. The full-backs should remain the same, as well as the midfield defensive two. Do not be surprised, however, to see Tommy McNamara grab his second start of the week in the attack or the midfield. NYCFC’s red hot form continues, winning four of the last six matches and staying undefeated at home. City’s nine home victories are an MLS best, with no other club tallying more than six. The Crew have won just one of their last seven matches, and are coming off a 4-0 defeat against the LA Galaxy. Still fourth in the Eastern Conference, however, the Crew could jump into the top three with a win on Saturday night. The last meeting between these two clubs is tough for City fans to forget, as it was the second leg of last season’s playoff disappointment. Headed into the home leg trailing 4-1, NYCFC had a huge hill to climb, and almost did. Rodney Wallace won a penalty in the 14’, which David Villa converted. An Andraz Struna shot in the 52’ was deflected and hit the back of the net, creating a 4-3 aggregate scoreline. The rest of the match was defined by City misses, Zack Steffen saves, and both posts, as NYCFC was again eliminated in the first round. The unsung hero of the first half of the season, Maxi Moralez has played in all but 14 minutes this season for City. His ten assists are tied for most in the league, and his seven goals are only one behind the team lead. Even more impressively, Moralez ranks sixth in MLS in expected goals plus assists, placing him in elite company. While NYCFC’s stars have been injured, El Frasquito has shouldered the load for City, and is arguably the team’s MVP through the first half of the 2018 campaign. Many may not realize it, but USMNT Forward Gyasi Zardes has revitalized his club career in Columbus. Tied for second in goals scored and alone in second place in expected goals in the league, Zardes is the key to the Crew’s attack. His eleven goals are the second most he has scored in any MLS season. On top of those accolades, Zardes has played the second most minutes in MLS this season, showcasing a durability that few goal scorers possess. Columbus’ recent acquisition of Patrick Mullins will only take some pressure off Zardes, who is the new centerpiece of the Crew attack. On the tail end of the Hudson River Derby, City’s most impressive win of the season and a tactical masterpiece by Domè, NYCFC will look to continue their incredible home form (8-0-1) against the red hot Montreal Impact. The quick turnaround will certainly be difficult, while also looking ahead to Saturday’s match against Columbus in only three days as well. With three games in a seven day span and injuries to several key starters, City’s lineup will be difficult to predict. After a solid thirty minutes off the bench on Sunday, I believe that Ronald Matarrita will get the start, giving Ben Sweat rest. Fresh off an injury of his own, Maxime Chanot should get the night off after earning MLS team of the week honors, allowing Sebastien Ibeagha to reclaim his starting spot, if only just for a game. NYCFC Player of the Month Anton Tinnerholm should remain in the lineup, but do not be surprised for Saad Abdul-Salaam to get the nod. Jonathan Lewis deserves the start, and should get it with Ismael Tajouri-Shradi’s injury on Sunday. Lastly, I believe that Tommy McNamara will get a game under his belt after a solid Derby performance by Ebenezer Ofori. As we have been saying all season, City’s form depends heavily on where a match is played. Winless in their last six road matches, Domè needs to bring a consistency to the team regardless of venue. Luckily, City’s next two matches are in the Bronx, and all three points seem necessary to keep pace with Atlanta United. After a poor run of form to begin of the season, the Impact are one of the hottest teams in the league since June. Winners of four in a row and five out of six, including four clean sheets, Montreal come to the Bronx will loads of confidence. Last September, NYCFC traveled across the border to grab all three points against the Montreal Impact, winning 1-0. City was all over Montreal for most of the night, with Jack Harrison scoring an outside of the foot wonder-goal from a one-two with Rodney Wallace. NYCFC were unlucky to score only once, with Wallace missing golden chances and David Villa hitting the crossbar late. Six points behind Atlanta United with two games in hand, NYCFC have two must-win games this week to keep pace. The Impact are currently holding the final playoff position by one point, and are the only team in MLS yet to draw a match this season. NYCFC fans know how great Jonathan Lewis has been this season, and hopefully Domè now knows as well. Even with the riches of depth that City hold on the wing, Lewis should be playing week in, week out. When Lewis sees the pitch, NYCFC simply have a more dynamic attack. His pace and ability to beat defenders one-on-one is unrivaled by any other player on this roster. Jonathan Lewis is the future of the City attack, and deserves ninety minutes to further prove so in the Bronx on Wednesday night. Ignacio Piatti is one of the most dangerous players in MLS, and he will look to showcase why on Wednesday. His efficiency on goal is incredible, scoring nine times on only fifteen shots on target. He is one of only ten players this season with over 10 expected goals plus assists, and is in the top three in key passes for forwards. Piatti has scored four times during Montreal’s four game winning streak, and is as important to the Impact as any player is to any team in the league. On Sunday, NYCFC embark on a seven day, three game homestand beginning with the Bronx Edition of the 2018 Hudson River Derby. With David Villa unlikely to suit up due to injury, City’s supporting cast with face their biggest test of the season. Luckily, the boys in blue have been the best team in MLS at home this season, going undefeated (7-0-1) and conceding only 4 goals in 8 games, creating a +17 goal differential in the process. The pressure will be on for Domènec Torrent’s first New York Derby, as tactical changes must be made to beat the Red Bull press. NYCFC have responded to the pressure by making incredibly impressive hires to Torrent’s coaching staff, adding four former Barcelona assistants and trainers. With news also coming Friday that Red Bull Manager Jesse Marsch has departed the Red Bulls for Europe, the pressure will be on interim manager Chris Armas as well. We’re going to learn a lot about Domè, our club, and the rest of our season’s prospects this weekend in City’s most important match thus far. Last Saturday, NYCFC traveled to Toyota Park in Chicago and blew a 2-1 lead, losing 3-2 to the Fire. Chicago winger Aleksandar Katai torched City for two goals in a five minute span, capitalizing on two mistakes by Ben Sweat. If there was any bright side to the loss, NYCFC have not suffered back-to-back losses in over two seasons, a streak dating back to April of 2016. Although losing both contests to the Red Bulls thus far in 2018, the all-time series at Yankee Stadium is tied 2-2-0. The recent form of our cross river rivals has been undeniably fantastic. They have lost only one of their last ten matches, tallying four clean sheets. Averaging two points per game, the Red Bulls rank first in the Eastern Conference, showcasing their incredibly strong start to the season. NYCFC, under Domé, has been coming out in a 4-3-3 with Ring and Maxi having far more freedom than Ofori. This is putting a lot of trust in Ebenezer as a sole pivot, but with Ring at CM it’ll be easy to drop into a double pivot if the game calls for it. The back four of Sweat - Callens - Ibeagha - Anton seem to have the new gaffer’s trust, but don’t be surprised if Chanot comes in for Ibeagha. Playing Isi on the left as an inverted winger and Lewis on the right will be great outlets over the top of the Red Bull's press. With Villa out for the foreseeable future, Berget gets a crack at being the man in the middle. Having a true targetman is a card the Blues have rarely played. The front four of Maxi - Isi - Berget - Lewis all have the positional flexibility to fill multiple roles. Expect Maxi to look to overload on the wings to encourage underlaps by Isi, Lewis, Sweat, and Anton, while also being an outlet in build up play from the back. Ring, with new positional freedom, will look to alleviate Maxi’s large list of responsibilities. Even with Jesse Marsch officially leaving the club on Friday, assistant Chris Armas will stick to their tried and true system of 4-2-3-1 with high levels of pressing at every turn. The partnership of Parker and Long has solidified the back. Kemar Lawrence, coming off a great game, will get a go, but if Murillo is back expect Lade to sit. The American midfield duo of Adams and Davis is amazing at setting a good base for the front three of Valot, Muyl and BWP to take risks pressing. Valot likes to sink into the midfield to playmake and alleviate pressure. Muyl (or Royer) will play opposite as a true winger. Kaku will float centrally and create pressure via passing and pressing of Ofori. Up top, Wright-Phillips is still the focal point of the attack. Expect him to be a threat aerially running off defender’s back shoulders and beginning the press by dividing the field down the middle between NYCFC’s two centerbacks. After looking over NYCFC’s record against NYRB, a pattern emerged around how starting a speedster and dribbler on the wing is a good counter to the Red Bull press. Since 2015, NYCFC is 3-1-8 in all competitions against the Reds across the river. In all four of the games where points have been earned for City, Jack Harrison started on the right wing. He was a dynamic outlet and singular chance creator that helped relieve seemingly relentless pressure. Domé needs to field a player in that mold for continued success. That is why starting Jonathan Lewis, a player with similar attributes, will provide the highest return. He will also drive back NYRB’s opposing fullback Kemar Lawrence, potentially neutralizing the dynamic fullback. There currently is not a player on the roster that possesses the pace and the technical ability, Medina being a close second, that can deliver more bang for the buck against a high pressing opponent like the former MetroStars. Building out the back is a principle that Patrick Vieira brought to NYCFC and has become a calling card of the club. So far, Domé hasn’t deviated drastically from this philosophy, which is shared by his role model, Manchester City’s Pep Guardiola. When facing a well executed and coordinated press like the Red Bulls, failure to clear the zone can lead to embarrassing goals against. Domé will hopefully look to offer different outlets for the Hudson River Derby. On goal kicks specifically, NYCFC has the most clear cut challenge against the Redbulls to its historical building out the back philosophy. Here are a couple of ways Domé could tackle this upcoming problem. All three solutions face drawbacks as there is no plan that has no risk associated with it. That being said, pragmatism and philosophical stubbornness are tools needed by managers to achieve the desired result. So let’s assess what would be the best course of action for Sunday’s night game. The English Solution of going Route 1 goes against the philosophy of City Group’s Godking Pep, our former headman Vieira and current manager Domé. That being said, this solution does a good job of utilizing a skill, targetman, of Jo Inge Berget that David Villa does not possess. With Villa out, this is more feasible than ever before, but seems an unlikely choice by Domé. The Vieira Solution of doing the same action time and time again, playing short and building out the back, when executed well lends itself to high levels of possession and dominance that has made NYCFC a top five club since adopting the philosophy. When this approach goes bad, however, it feels like the world is falling apart. Scorelines end up out of hand and all team momentum is crushed. This pure philosophical tactic seems unlikely from Domé, as he’s seen too much not to be pragmatic. Lastly, the Hybrid Solution is one that combines both of these approaches. It allows for pragmatism and philosophy to coexist, triggered by reads of Sean Johnson. Just like a Run-Pass Option for a Quarterback in football, these reads are all about seeing where the defense is located and reacting accordingly. With the inclusion of Berget at center forward, the Route 1 approach is far more viable than ever before, but the DNA of the team should not be compromised so easily. The inclusion of an additional speedster in Jonathan Lewis paired with Isi on the wing allows for the ultimate release of a press, a long ball into space towards the opposition’s goal. Just like in basketball, if there is an over aggressive press, sometimes the easiest way to relieve pressure is to lead a man into space. That’s why having Jack Harrison on the field in 2017 was so important to having a positive series record, and why Jonathan Lewis may be the key to NYCFC dominance on Sunday. El Frasquito has been a revelation for NYCFC this season and will be central to City’s gameplan Sunday night. In the last league meeting between the two sides, Red Bull’s Tyler Adams man-marked Moralez for the entirety of the match, causing City trouble all afternoon. Domè will be aware of this, and surely use his tactical judgement to create time and space for Moralez on Sunday. Maxi is second in MLS among qualified players in Key Passes with 53, and is tied for second in the league with 8 assists. Looking at advanced individual statistics, Moralez ranks eighth in the league in expected goals plus assists with 10.41, placing himself in elite company. NYCFC forwards rarely get credit on the defensive end, but Jesus Medina, David Villa, and Maxi Moralez have been fantastic on both sides of the ball for a majority of the season. Maxi ranks in the top fifteen in total tackles and tackles per game among midfielders. For NYCFC to get all three points, Moralez will be key. The Red Bull keeper has been one of the league’s all-time best, and he isn’t going away anytime soon. Already top ten in MLS history in wins and holding the league record for consecutive games played, Robles has been a thorn in City’s side from the beginning. According to American Soccer Analysis, Robles is sixth in Goals Allowed minus expected, a stat that tracks goals saved from keepers. The Red Bull keeper will certainly be key, as City’s dynamic attack at home always seems to create chances on net. Although missing some time this season, Robles has held clean sheets in back to back games, (193 consecutive minutes) and will look to do the same on Sunday. 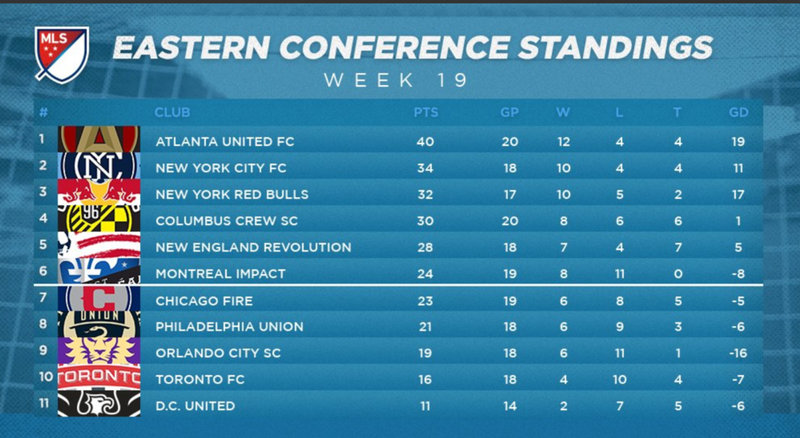 With Atlanta United losing on Wednesday night, an NYCFC win would place them within three points of the Eastern Conference lead, with a game still in hand over Atlanta. A loss would be incredibly costly for City, however, creating a four point buffer between second and third place in the standings.